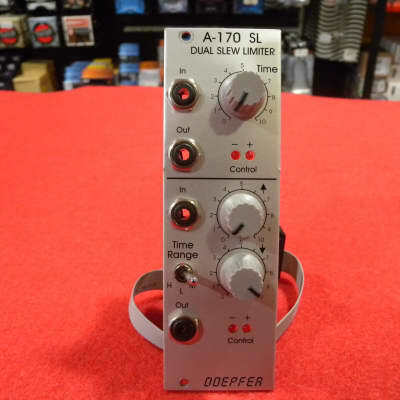 Module A-170 contains two separate slew limiters, also known as portamento controllers or integrators. The first SL has just one joint control, which sets both rise and fall times (c. 0 ...10 sec). The second SL has separate controls for rise and fall times, and can therefore be used as a simple AR envelope generator. Over and above this, you can set the overall range for these parameters, with a three-position switch, as on the full ADSRs. Both slew limiters have two LEDs each, to show the state of the rising and falling voltages. Additional technical remarks: If the upper slew limiter is used for precision applications (e.g. portamento/glide of one or more VCOs) a buffer (e.g. 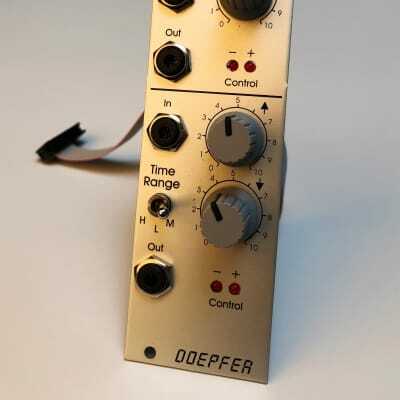 A-185-1 oder A-185-2) is recommended between the A-170 output and the VCO(s) input(s). The reason is a small voltage drop that is caused by the protection resistor at the A-170 output. An A-185-1 or A-185-2 connected between the A-170 and the VCO(s) avoids that voltage loss. For all A-170 manufactured later than May 2009 (recognizable by the label "Version 2" on the pc board) this remark is not valid as these modules are equipped with an additional voltage buffer at the output.